The River Walk is not only great for walking, it’s great for running too! From the Henderson Welcome Center at the Depot building, all the way to the end of the River Walk equals about 2.5 miles. So there are many ways you can mix up your running route to equal the length of a 5K (3.1 miles). Downtown Detour – If you want to switch up your running route, the River Walk is just a few blocks away from historic Main Street. You can easily take a detour from your usual route to look at all the beautiful Main Street homes. Main Street is very wide, so there is plenty of room for runners, walkers, and bikers. Main Street is bike-friendly with marked bike lanes for cyclers. Like this post? Click here for more tips on trails and travel. If you are ready to hit the road and train on the River Walk, here are some running routes that may help you train for your 5k! Parking – Turn right on Merritt Drive from 12th Street, there will be a small pull-off spot for parking. 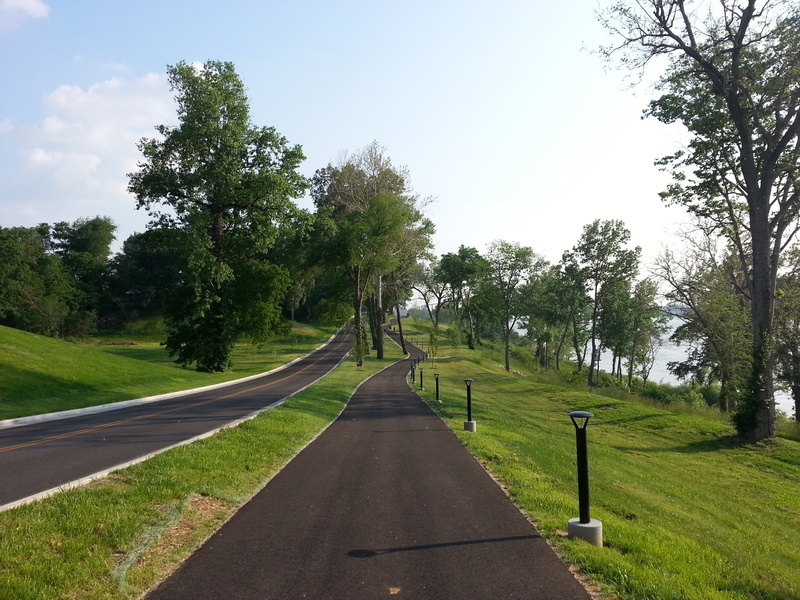 Route – Run 1.25 miles south (towards the riverfront). Continue until you reach the Depot Welcome Center, where you will turn around and return running north 1.25 miles towards where you parked. Continue another .3 miles until the River Walk path crosses through the parking lot off of Atkinson Park Road. It will be just after you pass through the covered part of the River Walk. Turn around and run back to where you parked you car, which will be .3 miles, and your complete running route will total about 3.1 miles. Parking – Enter Atkinson Park Circle off of North Elm Street as if you were heading to Hays boat ramp, and park near the River Walk’s beginning. Route – Grab a quick drink of water and get a quick stretch of those calf muscles because you will encounter some hills here! You will see a brown and green route marker, this is where you will begin. What’s great about this route is it has these visual markers all throughout the route. Run for 1.25 miles south, you’ll know when to turn around when you reach the overlook with the benches and Audubon statue that is at the corner of 12th Street and Merritt Drive. Grab a quick drink from the water fountain, turn around and head back from the direction you came. When you’re back to where you started, your complete running route will total about 2.5 miles. Parking – Free 2-hour parking is located at the Depot Welcome Center at 101 N. Water Street. Route – If you have plenty of time to kill and are still training to build up to your stamina for your 3.1 mile run, you might prefer this route. Begin your run at Audubon Mill Park by heading north 2.5 miles until you reach the end of the River Walk Route near the parking lot listed in Option B. Take your time for the scenic walk back– you deserve it! You just ran the entire River Walk! Ready to kick it back up in gear? When you approach the overlook with the benches and Audubon statue that is at the corner of 12th Street and Merritt Drive, grab a drink of water, and finish out the home stretch of your run! Upon completing this route you will have traveled almost 5 miles by foot. Way to go, you! No matter what route you take you should snap a photo of your accomplishment and share on social media using #HendersonKy or #ismynature and tell us how you discover your nature! Did you like this post? Get more tips on trails and traveling in Henderson by downloading your free Travel Guide by clicking this link.